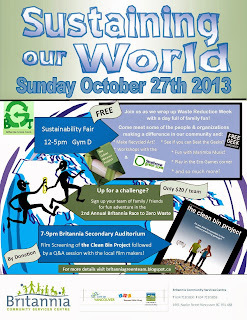 Here's an update on the details for the Sustaining Our World event coming up on October 27th! For the Sustainability Fair in Gym D from 12-5pm, we have a great variety of people and organizations working towards sustainable solutions to come and share their efforts for our community, so come on down and see all the good happening in our world already! Join us for hands on activities including a "Beat the Geek" gaming challenge with our friends from Free Geek, a creative recycling craft zone, marimba music fun, map out the green potential of our neighbourhood and enjoy workshops with the Urban Weavers and the Strathcona Green Zone. If you and your friends or family enjoy a fun challenge, be sure to sign up for the 2nd Annual Britannia Race to Zero Waste which will have teams finding clues and working through activities together as they explore teh positive green world in our neighbourhood! 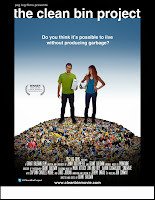 We'll end the day with a screening of the movie the Clean Bin Project from 7-9pm in the Britannia Secondary Auditorium. 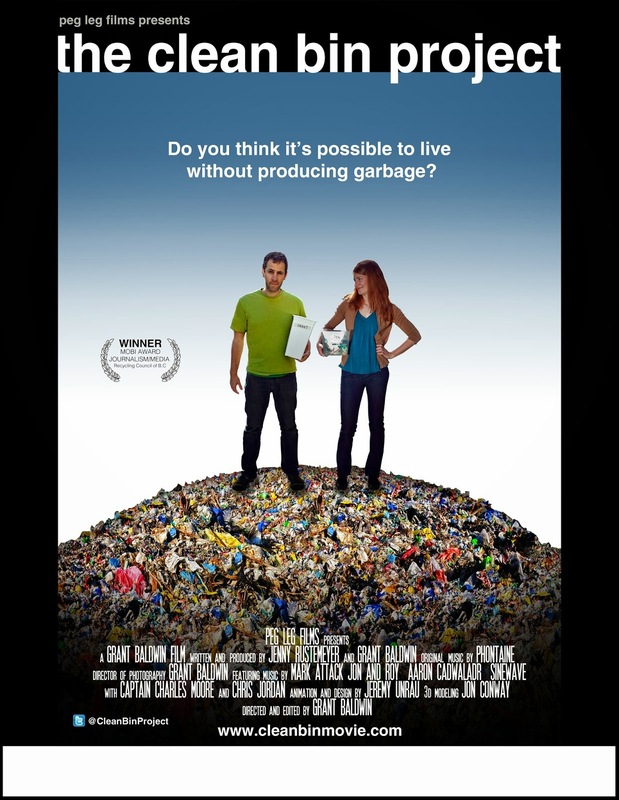 This film follows the ultimate zero waste challenge this community has ever seen and is bound to inspire you! Any money raised from race registrations and donations for the film screening will be used for new green initiatives here at Britannia! The 2nd Annual Britannia Race to Zero Waste is shaping up to be a whole lot of fun for teams ready to race this year! The race will begin at 2pm and will take approx one hour to complete. From the first challenge that will get you going, and clues that will take you the rest of the way, teams will get to experience adventure and a nice variety of green intitatives in and around our community. There are many opportunities to collect bonus points along the way and the team with the most points at the end of the race wins!! Extra bonus points will be given to teams that come out for the race with some funky green attire to show their green team spirit (ie Team Gangreen came out for alst years race with great green capes decorated with the mobius loop! ), and more bonus points for the group that shares the best green team cheer at the finish line! "We're keen, we're green, and we leave the world clean!" The route has been planned, the clues are ready and the challenges are set to go! Think you have a team of green keeners that can complete this amazing race with you? Teams can be 2-3 adults/youth, or up to 4 people if one or more members are under 13yrs old. Cost per team is $20, and only the team captain needs to register. or in person at Britannia either at the Info Centre or Pool cashier. * Joy and Todd will be teaching weaving spiders using English ivy with community - drop-in style so join in the fun anytime! An introduction to materials and techniques, Learn some basics and get inspired. Leave with a costume piece well underway and the knowledge to finish the project. Focusing on head, neck or shoulder adornment, there will be a group brainstorm on simple costumes. Supplies and tools included, bring along organic materials you would like to include. Ages 16 and up, limited spots. 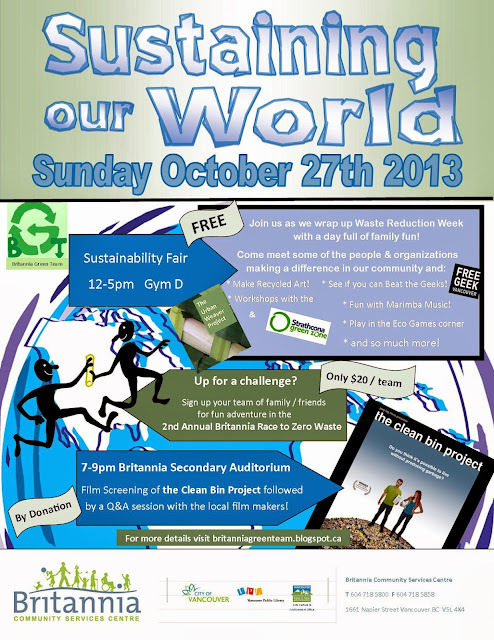 We are very excited to host a screening of the Clean Bin Project to wrap up this years Sustaining Our World event on Oct 27th! Grant and Jen go head to head in a comedic competition to live zero waste for an entire year. This multiple award winning, festival favourite shares moments of humour, struggle, and hope in the cinematic and creatively executed story of a couple who ask the question “What can an individual do?” Described as a combination of An Inconvenient Truth and Super Size Me, The Clean Bin Project features laugh out loud moments, stop motion animations, and captivating interviews with TED lecturers Chris Jordan and Captain Charles Moore. A fun and inspiring call to environmental action that speaks to crowds of all ages. This eco challenge, which features many places in East Van, will provide plenty of inspiration and information for all of us who want to reduce our footprints and produce the least amount of waste we can. The film screening is by donation, and will be held in the Britannia Secondary School Auditorium from 7-9pm. Someone left an article in our staff room recently with the sad news that the earth is warming faster than we knew..."read it and weep"
It is so darn easy to get down when the world is so messed up! But becoming overwhelmed and sitting around doing nothing doesn't make us feel any better, and it doesn't fix the problem. If everyone says "there's nothing we can do!" then we are absolutely right. So green keeners like me find even the smallest things we can do to try and make a difference. And guess what? This is actually good for you! Also don't forget that there are sooooo many people around the world and close to home that are working on solutions to a better world, and if young folks like Boyan Slat keeping building on their ideas, there is hope for us yet - so don't give up!! We may get those oceans cleaned up one day! Check out this site for your break time viewing boyanslat.com and see what I mean. Do you think his plan will work?